What began as a plan for expansion became a vision for transformation. 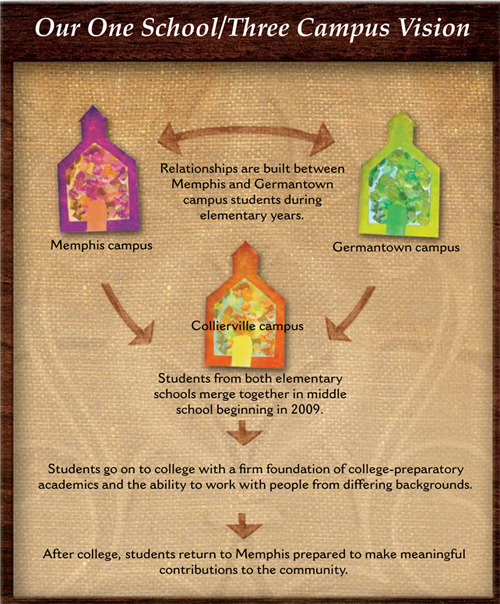 Fifteen years ago, SGIS was a single-campus elementary school situated in the suburbs of Memphis. School leaders envisioned adding a middle school and upper school campus in a nearby suburban community. The expansion would require raising $25 million in capital and countless hours of work. Then something interesting happened. SGIS broadened its vision. After much consideration, and with the help of an anonymous donor group, a new elementary school was opened in inner city Memphis, drawing students from low-income families throughout the city. Today, SGIS has increased their entire enrollment from 350 students to nearly 1200 students at all three of its campuses with approximately 140 attending the Memphis campus. SGIS elementary students, regardless of campus location, have identical educational experiences. Teachers from both campuses must coordinate class plans, activities and field trips so that all the students have the same opportunities. These cross-campus activities and joint-learning ventures also allow relationships to be formed and experiences to be shared at an early age. When the students finish fifth grade at their elementary campus, they all unite at the same middle school in the suburbs and finish out their St. George’s experience together through both middle and upper school. “This is not community service, this is community building,” says Sarah Cowan, Director of Communicationat SGIS. The unique educational model of one school/ three campuses aims to build bridges between the urban and suburban communities through common educational experiences as well as the relationships developed among students and families. After 13 years, Cowan reports the standardized tests results show strong progress in narrowing the achievement gap between urban and suburban students. As important, she notes, the St. George’s community is more inclusive and diverse. SGIS will graduate its first class from this model in 2016. It is the intent that all of these children will attend college and return to Memphis as culturally competent citizens inspired to improve their community.